Oaxaca A thousand years is a frightfully long amount of time. 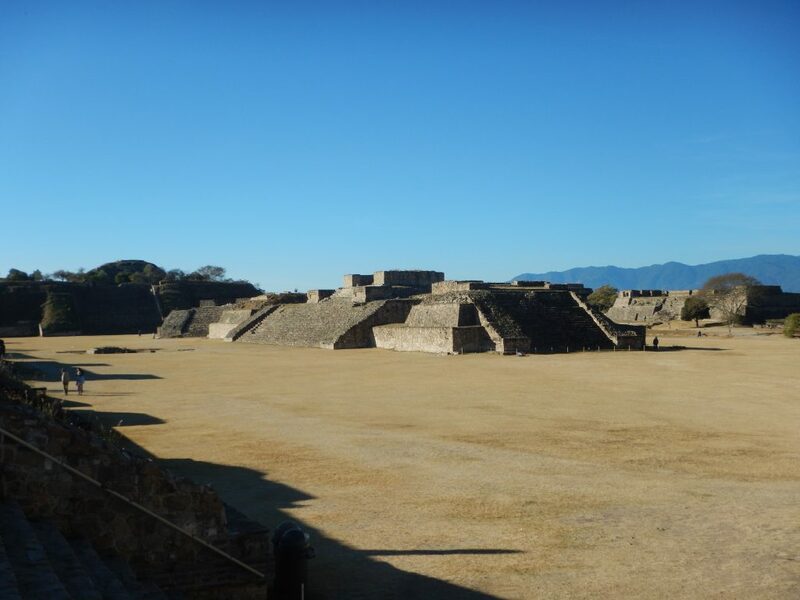 Think Romans, Greeks, Incas, Mayans, and native tribes, but also think about the Zapotecs, because that gives you an idea of the length of time that they dominated the Oaxacan valley of the Sierra Madres in southern Mexico. They did so from an amazing city that was as much fort as residential and ceremonial center at the height of 6400 feet, soaring 1300 feet over the valley floor. 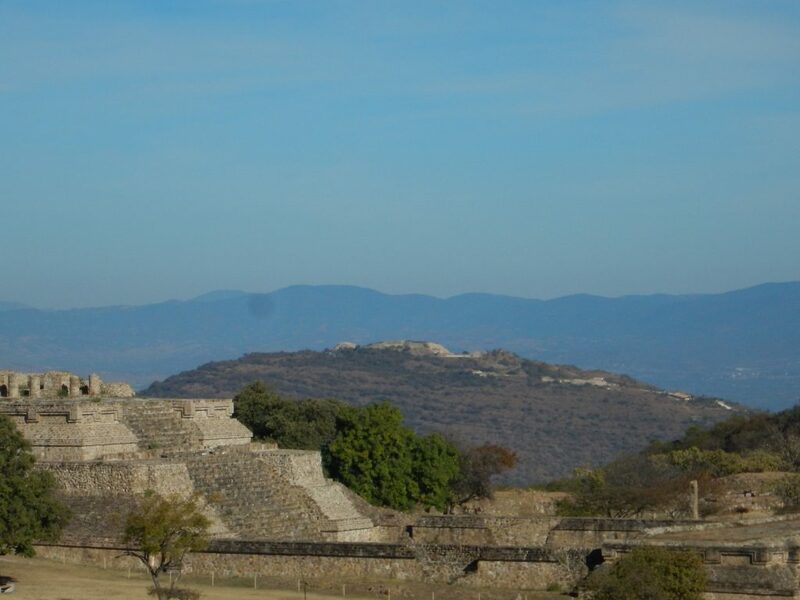 When you stand on top of the grand palace or the north temple, you can see for what must be hundreds of miles in all directions, across hilltops where other structures, likely part redoubt, village and lookout post, sit extending the power the Zapotecs must have felt was their birthright for untold generations. 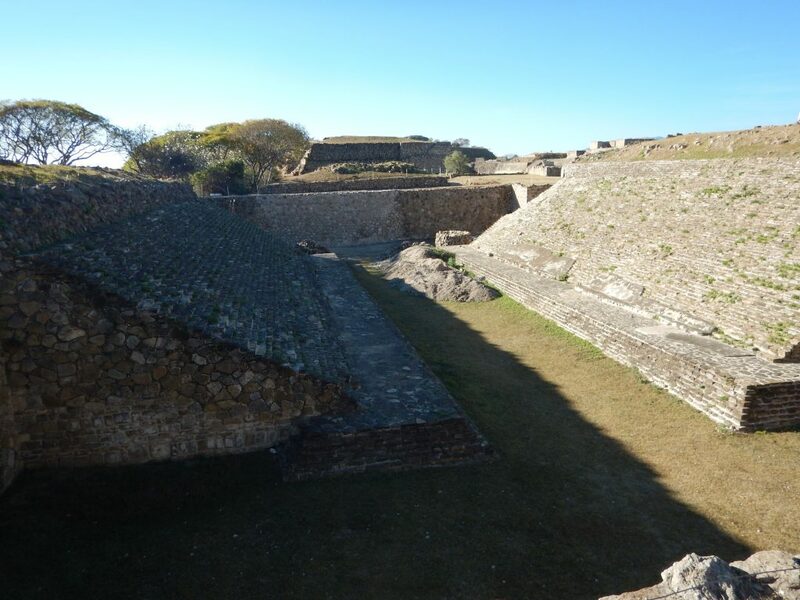 We are veteran observers of many archeological wonders of Mexico and other civilizations. Several years ago, we visited most of the major Mayan sites in the Yucatan peninsula. We learned invaluable, but hard lessons in long, hot lines under the beating sun along with legions of tourists. 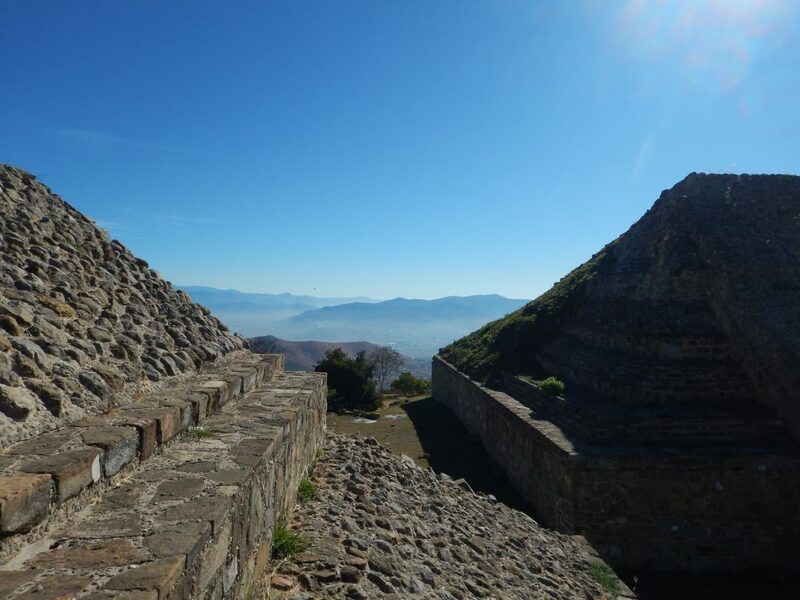 We finally got smart in seeking out Monte Alban, and the rewards were immense. Tours were advertised all over Oaxaca, many beginning at 10 AM. We saw that the site opened at 8AM, and we were pulling up to park in the shade by 815AM with only a few others. There were no lines, so we could ignore the ticket machines, which often do not work, depending on the internet or whatever. As we entered the grand plaza, we were virtually alone and the temperature was still mild, even as the sun rose higher. We couldn’t have been happier or more excited at the awe-inspiring sites on all sides of us. It was an amazing experience to be able to really absorb some feeling of the ancients and contemplate a whole civilization without hawkers, stampeding tours, and the stentorian voices of the guides. Two things were especially striking. …represent naked men in contorted and twisted poses, some of them genitally mutilated. 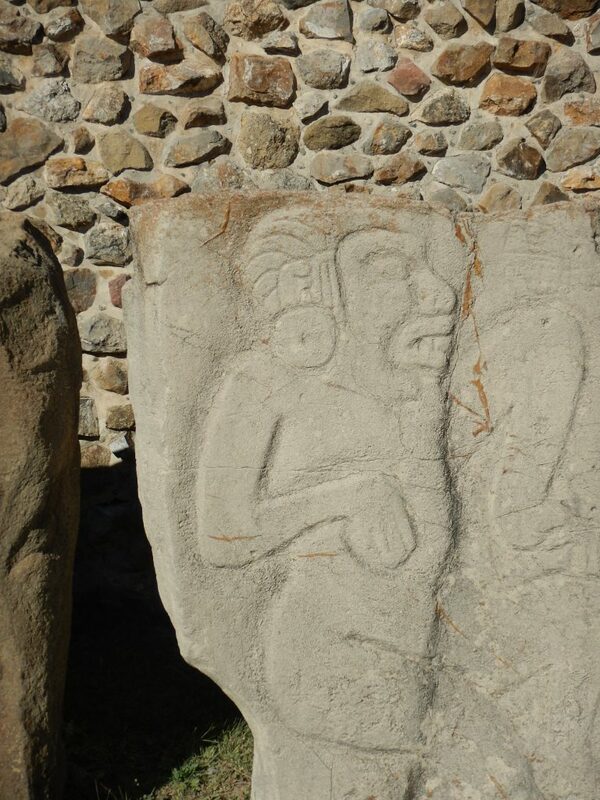 The figures are said to represent sacrificial victims, which explains the morbid characteristics of the figures. The Danzantes feature physical traits characteristic of Olmec culture. 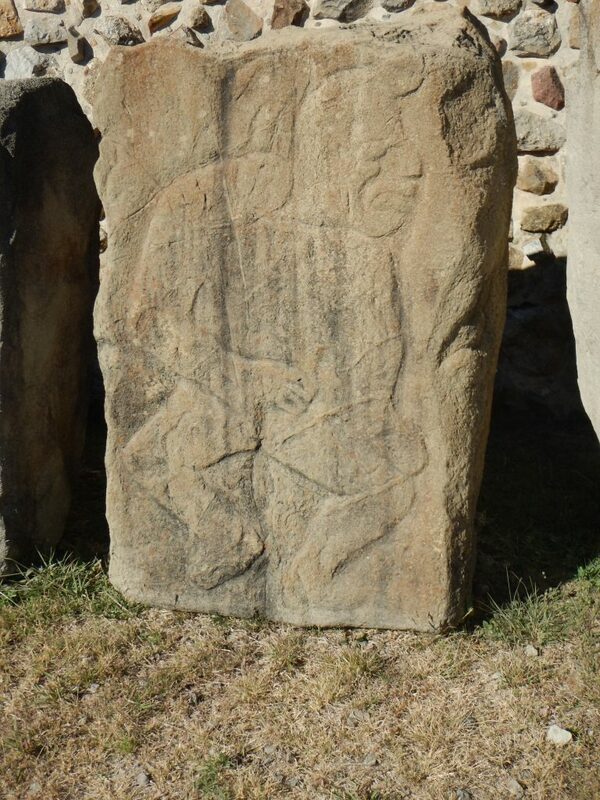 The 19th century notion that they depict dancers is now largely discredited, and these monuments, dating to the earliest period of occupation at the site (Monte Albán I), are now seen to clearly represent tortured, sacrificed war prisoners, some identified by name, and may depict leaders of competing centers and villages captured by Monte Albán. (Blanton et al. 1996) Over 300 “Danzantes” stones have been recorded to date, and some of the better preserved ones can be viewed at the site’s museum. A description at the site points out that these chiefs were castrated and drained of their blood, perhaps for sacrifice. This was serious business! 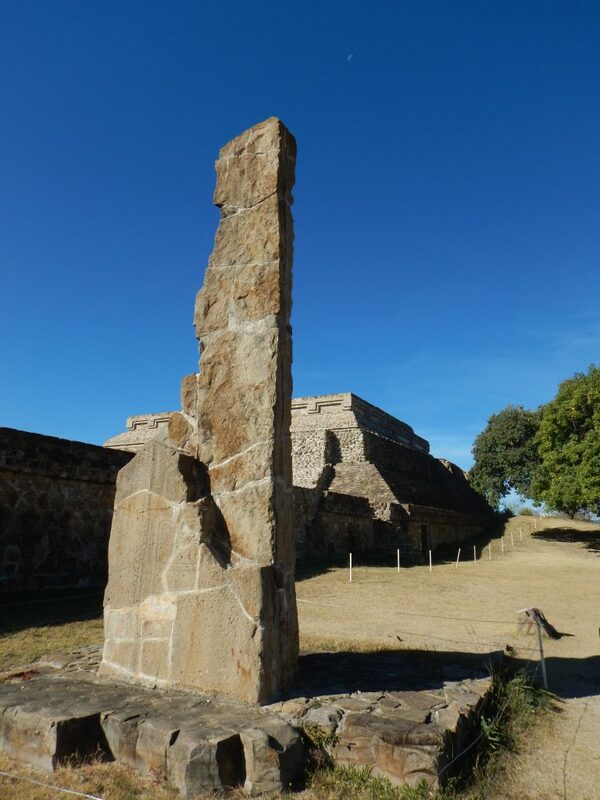 There was also a tall obelisk of sorts that was near the main plaza positioned to catch the sun at any angle. It was used to chart the calendar at 365 days as well as the winter and summer solstice and other events in the Zapotec year. Also, serious business and an achievement of unimaginable value. 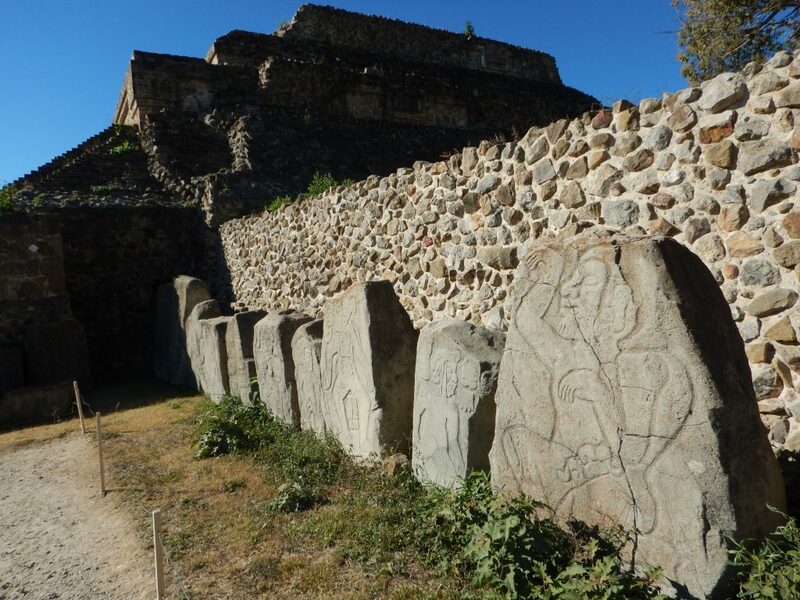 Another 1500 years later with the relatives of these people still everywhere among us, rather than respect their accomplishments, we abide a government as fearful of their descendants, as if the Zapotecs might be still as fearsome as they were in their time high atop Monte Alban. 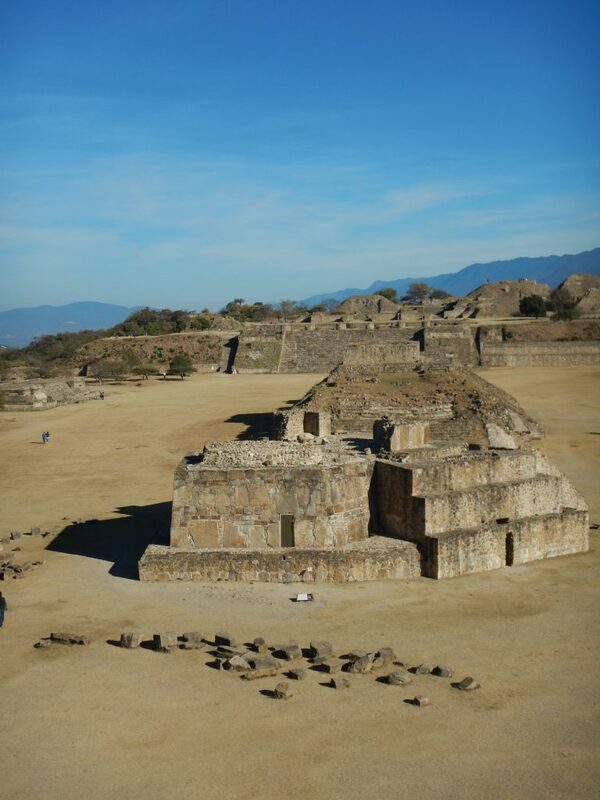 This entry was posted in Ideas and Issues and tagged mexico, Monte Alban by Wade. Bookmark the permalink.